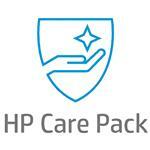 The Electronic HP Care Pack Services (e-Care Pack) capability allows you to order, receive, update, and activate a wide range of valuable HP Care Pack Services over the Internet. Administered through the HP Services Network (CSN), it is a fast and simple process that enables immediate registration and service activation. Increase equipment availability and productivity with rapid-response onsite and remote support for your HP hardware, as well as selected multivendor equipment. This flexible HP Care Pack Service covers desktops, workstations, servers, storage systems, network equipment, and printing. Choose 4-hour same business day hardware support when you need to: extend your hardware warranty coverage with prompt service for key systems and devices; obtain easy-to-buy, easy-to-use onsite services; improve hardware performance and uptime; increase the return on your HP and multivendor hardware investments; enjoy consistent service coverage across geographically dispersed sites.